There are a million little jobs around the house and the garage for which a rotary tool is the answer. What’s a rotary tool? Think Dremel. Dremel is a brand of rotary tool, but like people use Xerox when they mean copier, or Kleenex when they mean tissue, the Dremel name has become synonymous with the tool. Maybe because Albert Dremel invented the darned thing in 1932! A rotary tool (Dremel or any other brand) is a handheld tool that turns a small bit at high speed: 3,000 to 37,000 RPM. That’s a whole lot of RPMs. And that’s how it works: the rotary tool relies on extremely high speed to get work out of a small motor, unlike a drill, for example, that’s turning slower but providing much more torque, or rotational power. Most of you have seen them in action, and if you’ve seen it, you want it. So what can you do with this little motor screaming away in your hand? Tons of stuff. Depending on the attachment you put in its business end, or collet, you can cut wood, metal, or plastic; grind all those same materials, sand, polish, buff, carve, wire brush, and more. It’s all taking place on a small scale, though. It’s very handy for small tasks in tight quarters in the garage, say cutting off the end of a small bolt that’s too long, but in a place where you can’t get to it with a hacksaw. It’s handy for craft projects in the house, where you want the speed of a power tool but don’t need overwhelming power. Heck, our local nail salon has one for taking acrylic nails off customers; our dog groomer uses one to trim dog’s nails. Any application where you can use a small tool, smoothly turning at high RPM, that’s where you want a rotary tool. The Dremel 4000-6/50 120-Volt Variable-Speed Rotary Tool kit earned its rightful place at the head of our list by including the tool, and a wide range of accessories to do almost anything you can think of. The 1.6 amp motor is powerful, and can be controlled through a range of 5,000-35,000 RPM. Everything you need (and probably a few you don't, but you'll be happy to have) is right there in a molded plastic case. This kit from Dremel shows why they are the top dog in rotary tools. Not only did they invent the thing, but here you see the latest model, the pinnacle of rotary tool evolution, the Dremel 4000. It's a corded model, with a six foot cord to give you plenty of reach. It comes in a kit with dozens of attachments and accessories for all those little household and automotive chores you just can't escape any longer. Silicon carbide grinding stones let you work on non-ferrous materials like stone, glass, ceramics and porcelain. Steel and iron can be shaped, cut or smoothed with tungsten carbide cutters. You'll be pretty smooth yourself when you have a Dremel 4000 at your side. Cut-off wheels provide the ability to cut materials with minimal fuss. Do wear your safety glasses though, and gloves aren't a bad idea. With an appropriate tool, this Dremel rotary tool will cut almost anything: metal, wood, concrete, brick, porcelain, marble, ceramics, drywall, tile, and more! Remember this is for the small jobs and small spaces, though, not the big industrial-sized jobs! You always need the right tool for the right job, and this one will handle everything you need it to. This is probably the most expensive tool on our list, but it is without question the best. A 1.6 amp motor controllable through a wide speed range, the basic tool is capable and state-of-the-art. It includes pretty much every accessory and bit you might want, right in the package. No buying essential extras here! We rate it as an excellent value, for its quality and its completeness. You'll not be disappointed. 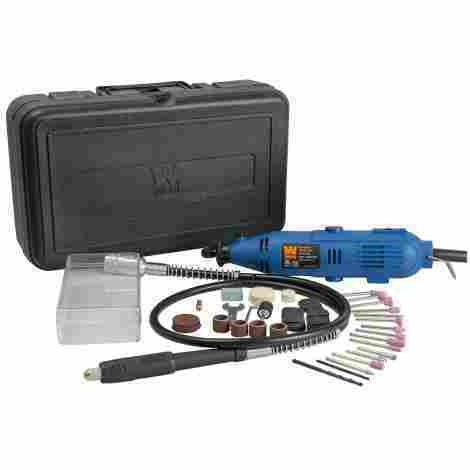 The WEN 2305 is a 1-amp drive motor tool in a case with a variety of bits: grinding, sanding, and polishing tools. It also includes a flex shaft attachment. The variable speed drive operates from 8,000 to 30,000 RPM. WEN knows the rotary tool market and this example would make a nice addition to your toolkit. There is a flex drive extension included in the kit. What's it useful for? It's great for doing fine work like engraving, since it gives you a much smaller, pencil-like tool in your hand. This lets you work with a more natural motion of your hand than if you are gripping a relatively large tool. You'll probably be inspired to try things you've never done before! The WEN tool operates from 8-30,000 RPM. Remember, we said these tools substitute raw speed for torque, so a lot of speed on the top end means getting jobs done, and quicker. If your workpiece is smoking or melting before your eyes, it's time to slow down, though. Reduce the speed using the handy side-mounted control, and you can get the temperature under control. This is a lower price-range tool, but is still fully cable and from WEN, a respected manufacturer. We rate this tool a solid "good" in the value range. Don't worry, be happy! You'll love the price, and the tool! Dremel holds two of the top three positions on our list because they make quality gear, like this 7700 cordless rotary tool. It has a removable 7.2-Volt Ni-Cad battery pack with charger in the package. It has two speeds. Cordless is a very handy and useful way to go. 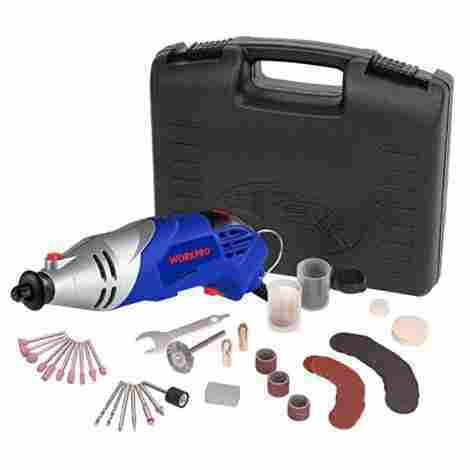 The Dremel 7700 is a cordless rotary tool powered by a removable battery. The kit comes with a 3-hour charger. That's a mighty convenient tool, a grab-and-go, get-it-done-now option. No stringing extension cords around the garage! On the down side, you get one battery pack, and when it's done, so are you. For three hours. Additional batteries are available, but that's extra cost. Still, it's a great idea and a great tool. The 7700 comes in a nice case too keep things together, and a good assortment of tools to use at the business end of this powerful little tool. You'll probably want a few more, but there are plenty to get you started. 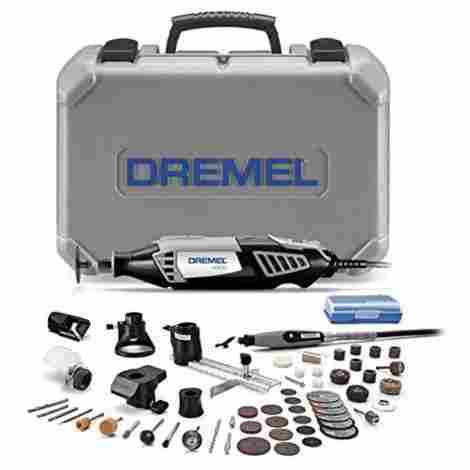 Dremel accessories are widely available, so you'll have no problem finding what you need. This Dremel unit is towards the lower middle of our price range when considering rotary tools. It's a good value for what you get. This might be a good choice to augment a corded tool, rather than as a stand-alone unit. Either way, think of your needs and choose accordingly; a rotary tool is one of the handiest things you can own. The Black+Decker RTX-B has a powerful 2-amp motor, comes with 5 accessories, and is ready to make your tough detail work easier. It has 3 speed settings, 12,000, 24,000, and 30,000 RPM, allowing excellent control in all applications. As a rotary tool, it is as competent as they come. When you think of powered hand tools, the name Black+Decker pops to mind immediately. Didn't all of our dads have a Black+Decker corded 3/8-inch drill? Of course, nowadays, there are Black+Decker toasters, coffee pots, and the like, but that brand always brings to mind hand-held power tools. So it's no surprise they've put out this rotary tool, the RTX-B, which lands in fourth position on our list. 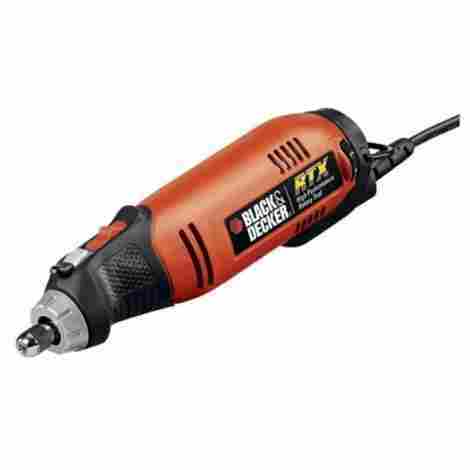 I know we've said these tools specialize in pure, high speed rather than torque, but the Black+Decker RTX-B has a bit of both, with a full 2-amp motor turning at three speeds: 12,000, 24,000, and 30,000 RPM. High speed and torque mean you have one capable tool in your hand. Around the mid-point price on our list, the Black+Decker RTX-B will not empty your account. It only includes a few accessories, though, you will want to buy a few more. But it does have one of the most powerful motors in this class of tools, so you will be happy with your purchase. Fifth on the list is Milwaukee's 2460-21. 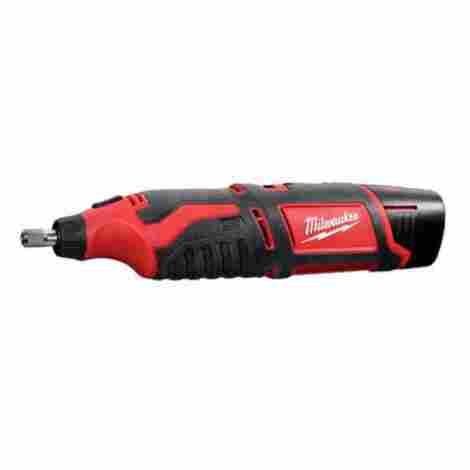 This rotary tool is cordless, using Milwaukee's standard M12-series batteries, with their trademark REDLITHIUM technology. The tool can turn at a continuously variable range of 5,000-32,000 RPM. That top end is pretty impressive. This entry is from Milwaukee, with their iconic red and black livery, and it's a high-quality, cordless rotary tool with a continuously variable speed range from 5,000-32,000 RPM. It feels and looks solid like you'd expect from a Milwaukee rotary tool. This rotary tool is cordless, and includes one of Milwaukee's M12 batteries (we happen to have several M18 tools and batteries around the shop). The M12 series is extra awesome because that same battery can power over 40 other Milwaukee cordless tools, from drills to polishers, and even including a heated vest for those super cold polar vortex days! This is a premium quality tool, and rolls in at a premium cost. It features a protected front bearing, and shielded, grinder-style air exhaust ports to ensure durability and long life. It is a "bare tool" package, meaning you get the tool, the battery, and that's about it. Accessories are up to you. This is OK, leaving you to choose what you exactly need and want for your precise application. 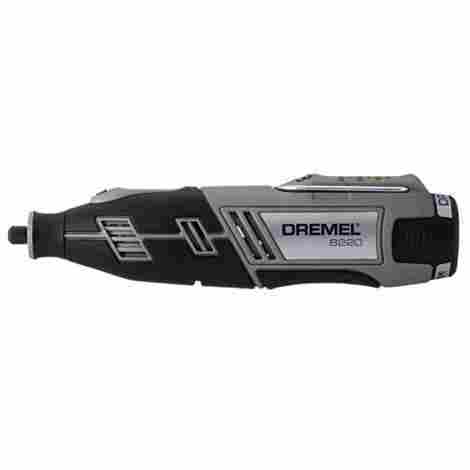 Sixth out the gate is Dremel's 8220 cordless tool. A robust, powerful cordless rotary tool, the 8220 is powered by a removable battery pack the recharges in a quick one hour. 28 accessories and a carrying case round out the package that will land on your doorstep. Charge it up and go straight to work! 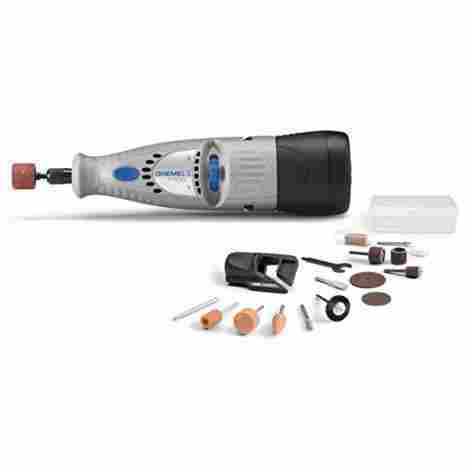 This rotary tool, the Dremel 8220, will work with all of Dremel's complete line of accessories. It will work with pretty much everyone else's too, the 1/8-inch shaft size being near-universal, and 3/32-inch closely following. You can change to different shaft size accessories by changing the collet at the business end of the rotary tool, a simple task of only a few seconds duration. Dremel does a great job of engineering their rotary tools. Put one on your workbench and have Dremel quality ready when you are! The battery pack is replaceable, meaning you can buy a few extras and keep a charged pack on hand at all times. You might need that, because the battery tends to run down quickly under heavy use. This rotary tool is in the mid-upper range of the tools we are reviewing on our list. It's a strong entry, and if you are thinking of going cordless, this may be just the ticket! 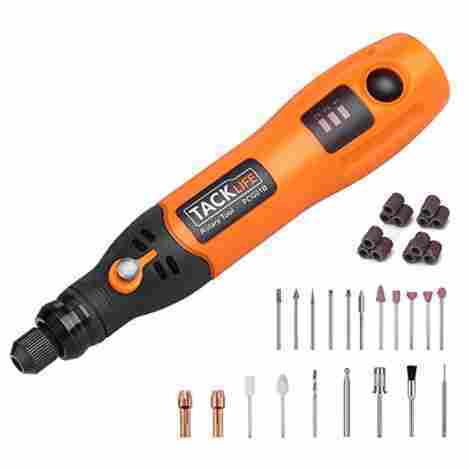 Seventh on the list is the Tacklife PCG01B, another rechargeable cordless tool. It turns at one of three selectable speeds: 5,000, 10,000 and 15,000 RPM. 31 accessories are included as well a case and a USB charging cable. This rotary tool is rechargeable via a USB cable, a modern touch! It does not include an adapter, but these are pretty much ubiquitous at this point anyway. The battery pack is not removable or changeable. It's still a capable, handy piece of gear, within its limitations. The 31 accessories include both 1/8-inch and 3/32 collets, a drill, sanding drums, polishers, and grinders. you can benefit from the standard collet sizes to buy additional accessories in standard sizes from any maker. This rotary tool is at the lower end of our price range. The manufacturer states right up front that this is not an industrial-strength tool, but is best suited for light home use. If that's all you need, you can pick one of these up cheap and take care of those little jobs right away. The eighth place rotary tool is this kit from GOXAWEE. It's a corded tool, with standard-sized colleges. 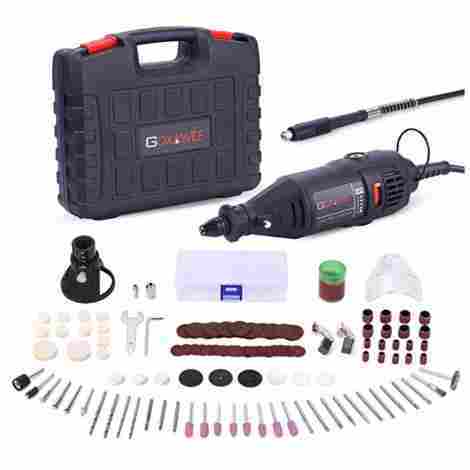 It includes a big assortment of 140 accessories, including a desirable flex shaft, and a wide assortment of sanding discs, drums, grinders, engraving bits, and more. GOXAWEE, or is it Goxawee? Whatever it is, it's a 1-amp rotary tool with an amazing variety of accessories! You'll find everything you need to do almost any common task, right in the package. The corded model saves charging or looking for battery packs. The speed is controllable across five discreet steps across a range from 8,000 to 30,000 RPM. Whichever it is, we like this rotary tool and think it's a good piece of equipment. In an unusual twist, the accessory kit includes a set of spare brushes for the motor. The brushes in an electric motor transmit electric power to the rotating part of the motor. Since they are stationary and the shaft is rotating, there is wear that occurs as the tool runs. Eventually the motor will lose some efficiency, or perhaps run intermittently or not at all. GOXAWEE includes extra brushes right in the kit, which did make us wonder just a bit how fast they'd need to be replaced. This a lower-mid price range tool, and given its wide variety of accessories, is a pretty good deal. We'd think this would make a great gift for the mechanic or do-it-yourselfer in your life. We don't hesitate to place it on our list, give the price-point and completeness of the kit. 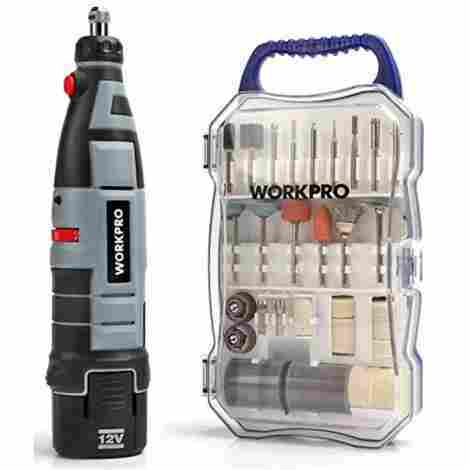 Number nine on the list of rotary tools is this WORKPRO W004508A kit. A corded tool with a 1.4-amp motor, the WORKPRO combines power with an long list of 104 included accessories. This tool operates at speeds continuously variable from 8,000-35,000 RPM. 1.4-amps is a little higher than average for the lower-end tools, and that's a plus! These tools work by turning at high speeds, but a little more power will keep them from bogging down during heavy going. This is a nice plus at this tool's price-point. You should be aware that the tool case may flex a little if you put heavy pressure on it. Nonetheless, this rotary tool will get the job done. There are a ton of accessories included, from the usual sanders and grinders to two diamond engraving bits. Those will do a fine job of helping you express your creativity engraving glass, stone, or even precious stones. You need to supply your own skill and bravery if you try the last, but it can be done! This is an inexpensive kit, considering everything that's in it. It's a decent value for the money, we don't hesitate to recommend it on our list, albeit at a position a little towards the bottom. The last machine on the list of best rotary tools is the WORKPRO Cordless entry. This rotary tool includes a 12V lithium-ion battery, charger, and a 70-piece accessory kit containing a wide variety of accessories to match every task. The motor is controllable in 6 steps from 0-22,000 RPM. It comes with a 2-year warranty. You'll enjoy using your cordless WORKPRO rotary tool with its ergo-friendly soft touch grip section, giving you ultimate control over the depth and direction of polishing, grinding, engraving or cutting. It is compact and lightweight for easy use and storage. We like what we see here, and so will you. This is a complete kit, containing everything you need to put your rotary tool to use immediately. You might need to take a minute to charge the battery, but everything you need for most jobs is included. Exercise your imagination and engrave or carve anything on almost any material. Or simply polish up the jewelry you've always meaning to get around to. Whatever it is, you'll be doing it quickly and efficiently after taking the WORKPRO Cordless rotary tool home. This rotary tool rolls in about the middle of our price range. That's not bad considering it has cordless convenience, 12V battery power, and 70 included accessories. It seems to us that this is at the right price-point for its features. We are encouraged that the last entry on our list is still this capable and complete. You'll be able to find something you like at a price you like, whatever choice you make. We’ll bet you can’t wait to get your hands on one of these rotary tools now that you’ve scanned the list we compiled. We can’t wait til the next time we have an opportunity to use one! There’s something satisfying about holding a well-crafted tool in your hands and letting it be the conduit for your skill, creating or repairing the things in your life that matter to you. These tools rely on speed rather than torque to get the job done. Applying a small tool turning 30,000 RPM to a small work area will make things happen quickly. So rotary tool motors come in at 1.0, 1.3 or 1.6 amps, usually. A few come in at a buff 2.0-amps. For comparison, a corded power drill with a 3/8-inch chuck comes in around 6.0-amps, turning at a much slower speed with much greater torque. They are different tools with different purposes, but you can see how the amperage compares between the two types of tools. There are a million… well, at least a few hundred different accessories for the rotary tools, one for everything you can imagine, and then a few dozen more you haven’t thought of. Polishers, grinders, wire wheels, drills, sharpeners, flex shafts, mini-drill press stands, router tables, sanding discs, sanding drums, reamers, on and on and on. Most accessories fit a 1/8-inch shaft size, but 3/32 is the next most common size, with 1/16 and 1/32 being seen in the marketplace. Any size accessory can be accommodated by changing the collet. Some tools can fit a drill-style chuck in place of the collet. Whatever you need, it’s out there somewhere. Most of these tools operate at speeds continuously variable from as low as 5,000 RPM to as high as 37,000 RPM. The latter is turning 616.67 times per second if you want to break it down that way. That’s fast. That, of course, is how their tools are effective, by turning very, very fast. Some tools on our list are selectable speed, for example, one turns at two possible speeds, 10,000 and 20,000 RPM. How fast you need depends on the material you’re working with and what you’re doing to it. All work generates frictional heat, and if your tool is turning so fast that it generates enough heat to melt, or worse yet ignite your workpiece, then you are going to fast. Throttle back and cool it down! That’s where a continuously variable range is nice because you can dial in just the perfect RPM, balancing speed of getting the work done with heat generated. Webster’s defying ergonomics as “an applied science concerned with designing and arranging things people use so that the people and things interact most efficiently and safely”. These rotary tools are designed with efficient and safe use, intended to be used without tiring our the hand or arm that bears them. The flex shafts that many of these tools include provide extra ergonomic-friendly use by allowing the user to wired the tool like a pen, allowing fine control during detailed work. When using the whole tool, most have a slightly flared grip region to allow a similar pencil-style grip, best for familiarity and control while using the whole tool. The last thing any of us want is stiff, sore fingers from using a poorly designed rotary tool, and we think you’ll like the feel of any one of the entries on this list. An easy tool change system saves you time and energy on the job, whether at home or professionally speaking. Most rotary tools utilize a push-button lock system to keep the shaft from rotating while you use a small wrench to loosen the collet. This is pretty quick and easy. Some use a flip-lever to freeze the shaft; others use a screw-up collar to engage the collet and allow you to loosen it. All of these are simple and intuitive, and you should be able to use them without much instruction. These simple accessory change systems are a plus when it comes to owning and using a rotary tool. The corded tools on our list are double insulated. Double insulated tools and appliances are instantly recognizable by the fact they have no third, ground pin on their power plug. A double insulated tool is very safe, and the chance of you receiving an electric shock from it is negligible. It is also generally lighter, and the cord is smaller and easily maneuvered. Double insulated tools are also generally cheaper and less expensive to manufacture, and this translates as less expensive to you, the purchaser. That’s a little counter-intuitive, we think, that the better-engineered tool is cheaper, but it’s a try statement and we like it that way! There are single-speed rotary tools out there, but we believe that the more control you have over the speed, the more successful your use will be. Always look for multiple speeds, if not a continuously variable range. A flew shaft is an extremely useful and ergonomic accessory, and we love tools that include one. There are all kinds of after-market version out there, so if your rotary tool doesn’t come with one, we know you can find one to fit. But if it comes right in the package, all the better for you. 1-year warranties on defects in material and workmanship are standard. We noted one tool had a 2-year warranty, this is a nice plus. Q: When is fast too fast? A: When your tool turns too fast, it generates too much heat. Next thing you know, your workpiece is smoking, or even burning! That’s obviously bad. You want the accessory in your rotary tool’s collet turning fast enough to do the job, but not so fast that excessive heat damages your part. That’s where that continuously variable speed adjustment on the better tools comes in. A quick adjustment on the slide control that seems to be standard will change the speed for you. Slow it down to keep cool. Q: Are more amps better, when it comes to my rotary tool? A: Yes, we like more power! The power a tool has is measured in amps usually. 1.0-amps would be minimum, and the tools here go up to 2.0-amps. Many are in the 1.3 to 1.6-amp range. If you have a choice, and all else is equal, choose the higher amp motor. It will tend to bog down less under a load, such as when you’re doing heavy grinding or cutting operations. And don’t you know, bogging down is a big drag. Don’t bog down, get more amps! Q: Are the accessories all a standard size? A: Mostly. We say mostly because there are several shank sizes for rotary tool accessories. These are 1/8, 3/32. 1/16, and 1/32-inch. The two larger sizes are most prevalent. Any maker’s accessory of a size to fit the collet on the tool you have will fit. Rotary tools can be used with different collet sizes; some come with them and some may be purchased after the fact. They will fit, though, so don’t be afraid to accessory shop, and if you see one you like at the local hardware store, jump in and get it, it will be fine. You’ll be cutting, carving, engraving, grinding and polishing in no time. Do pay attention to speed ratings; we note that some accessories have a top end on them, we noted some limited to 20,000 RPM. Q: Are there any safety concerns with rotary tools? A: Always, like always, wear eye protection, and gloves are recommended. During rotary tool operations, accessories are spinning up to 37,000 RPM. If you’ve not seen a cutting wheel disintegrate at 30,000 RPM you are in for a treat! A scary treat. Any normal operation will generate tiny chips flying out of the work area at high speed; abnormal conditions can yield large chunks hurtling out at ludicrous speed. If one encounters your cornea, you will not be happy, and neither will your ophthalmologist. A: We look at tools all day, every day. What’s not to like?